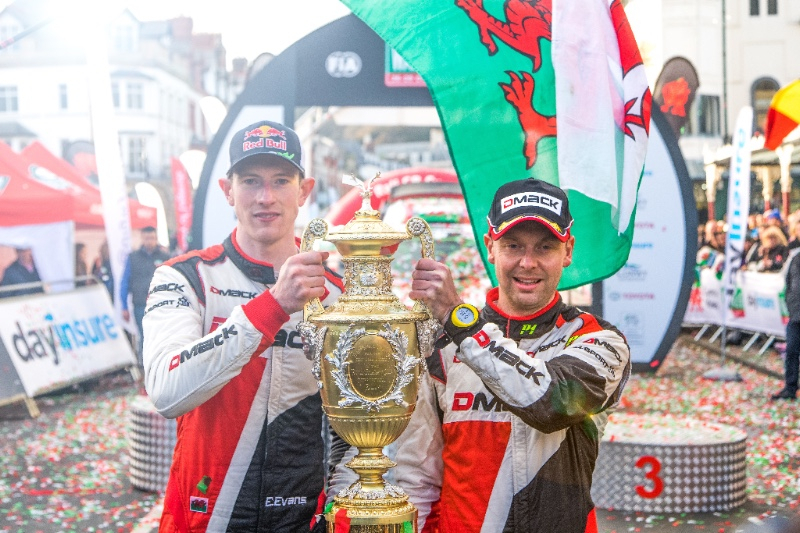 Evans had no chance of reporting his historic 2017 win on Wales Rally GB. Whether it is the FA Cup, Ryder Cup, America’s Cup, Webb Ellis Cup or the Ashes, Britain is famous around the globe for its iconic and inspirational sporting trophies. British motorsport, too, is blessed with some magnificent awards. The Royal Automobile Club Tourist Trophy with its 18 carat gold figure of Hermes has an unrivalled heritage while the gold plated, solid silver British Grand Prix Trophy is coveted by all Grand Prix drivers, not least Lewis Hamilton. Since the early fifties, the equally resplendent Peall Trophy has been awarded to the winners of Rally GB, today this country’s revered round of FIA World Rally Championship. By any standards, standing more than two and a half feet tall and weighing in excess of 18lbs with its mahogany base, it is an impressive trophy… and one that now bears the names of Elfyn Evans and Dan Barritt after their history-making exploits in last year’s event – Evans becoming the first Welsh driver ever to win a round of the WRC. Although Evans is one of only four acclaimed British drivers to have celebrated World Rally Championship success on home soil – the others being Roger Clark, Colin McRae and Richard Burns – the long-standing Peall Trophy dates back to well before the WRC was established in the seventies. The large silvergilt classical urn-shaped trophy, topped by a royal stag’s head figurine, was produced way back in 1887 by renowned Victorian silver specialists Stephen Smith & Son in London as, by a quirk of fate, was the British Grand Prix trophy. It was originally presented by the Billiard Association as the permanent award attached to its highly-prized ‘All In’ Billiards Championship when the competition was inaugurated in 1892. World billiard champion W. J. Peall won this first event and was never again challenged – thus the golden trophy became his personal property after three years. Billiards champion W. J. Peall and the impressive trophy. As well as being a legend on the billiard table, Peall was also a keen early motorist. Indeed, he was one of the very first to be caught speeding when stopped by the police near Redhill in 1901 and fined the princely sum of £2 for driving at a speed in excess of the 12mph limit. In 1937, the Peall family donated his splendid cup to Royal Automobile Club in Pall Mall. Subsequently, the Club redeployed the suitably renamed ‘Peall Trophy’ to be awarded annually to the ‘Best Performer in Royal Automobile Club International Rally’ as the inscription reads. It was first presented to Ian and Pat Appleyard, the victorious husband and wife Jaguar XK120 driving duo in 1953. Since then, the names engraved on the base’s gold bands have included just about all the rallying greats: Erik Carlsson, Timo Mäkinen, Hanna Mikkola, Stig Blomqvist, Ari Vatanen, Henri Toivonen, Juha Kankkunen, Carlos Sainz, Petter Solberg, Sébastien Loeb and many more of the sport’s top legends. This year’s Dayinsure Wales Rally GB entry list features three past winners – Jari-Matti Latvala, Sébastien Ogier and, of course, Elfyn Evans – plus plenty of other proven WRC winners all eager to see their names etched onto the prized Peall Trophy. Petter Solberg and Welsh co-driver Phil Mills celebrating one of their four consecutive Rally GB wins between 2002 and 2005. Whoever conquers the fearsome Welsh forests to spray the victors’ champagne, next month’s podium presentation will be a highly significant occasion with the illustrious old trophy being presented on Llandudno’s seaside Promenade at the conclusion of the town’s momentous new street stage. With free admission, many thousands of fans are expected to pack into the resort to watch world championship motorsport held on closed public roads for the very first time on the British mainland. Details of grandstand and hospitality upgrades – plus discounted tickets for the remaining 20 special stages – can be found on the official www.walesrallygb.com website. It’s not to be missed! In the meantime, the trophy will be displayed at Castle Combe’s popular Rally Day on Saturday 22 September before visiting various promotional destinations in Wales during the following week culminating in a special display outside John Lewis in Chester on Saturday 29 September. A full itinerary on where to see the much-admired Peall Trophy will be confirmed via the event’s busy social media channels.